May 23, 2015 By Tina M 4 Comments This post may contain affiliate links. Read my disclosure policy here. Ahhh. Summer is almost here. And my bike just recently arrived! I have been having so much fun taking the kids for rides, and BONUS: it’s great exercise for me! 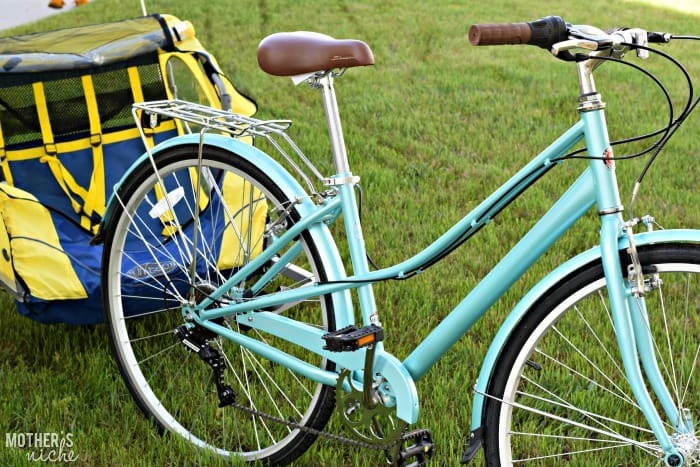 Biking is a great summer activity and I prefer it to taking walks because you can feel the wind blowing on your face and it doesn’t seem as hot outside. Our local pool is only a few miles away, so I fully plan on getting a season pass and biking the kiddos there frequently. 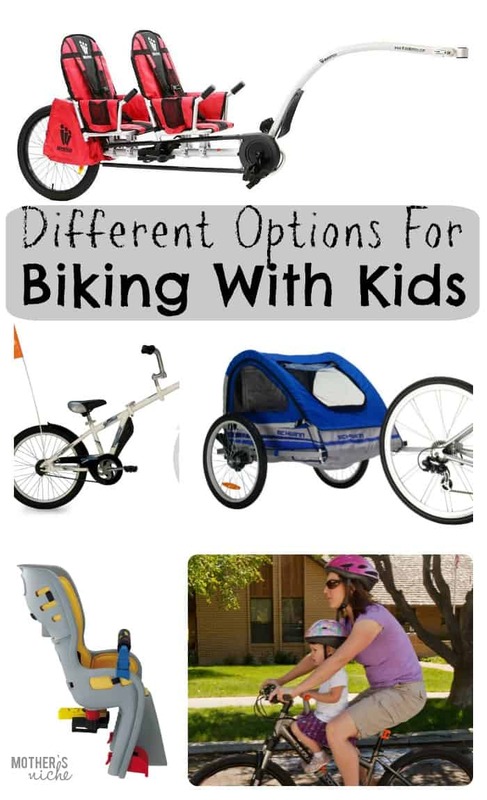 Depending on your family situation, you are going to choose different gear for biking with kids. I’ve divided them into two categories: Kids that can pedal, and kids that can’t. There are lots of fun options, so good luck choosing! These Kid Bike Trailers basically turn your adult bike into a tandem bike, only an adult/child combo, and you can take it on or off when you aren’t using it. 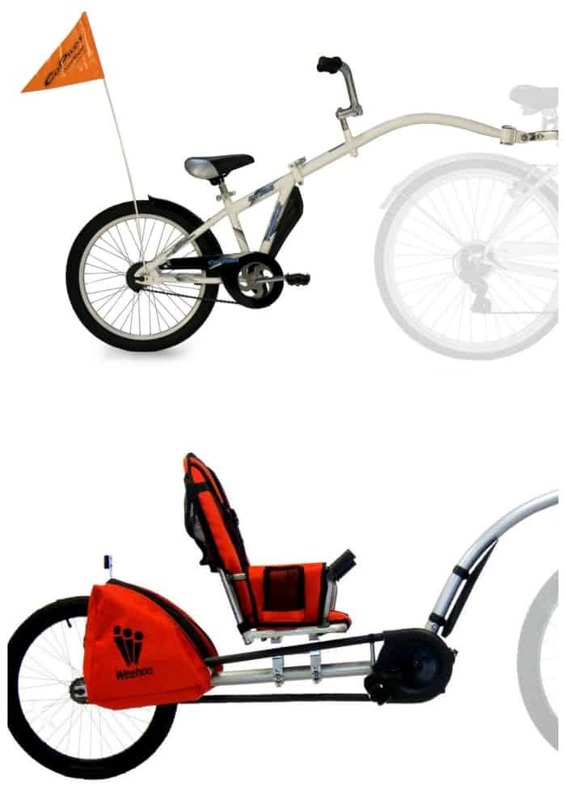 Similar to the previous bike trailer, only there is a back rest and the ability to strap the kid in. That wheel is linked to the iGo’s crankset, which allows your child to pedal along and put in some of the effort, too, while the chain is fully enclosed to prevent getting fingers nabbed or getting grease all over shoes and pants. The trailer attaches simply and easily to the pulling bike’s seatpost via one of five different included seatpost diameter bushings. You can also buy this trailer on Amazon through this link. If you don’t want to be pulling anything behind you on your bike, this will likely be the option that you choose. You can buy a seat that hooks on in front of you, or behind you, depending on your preference. 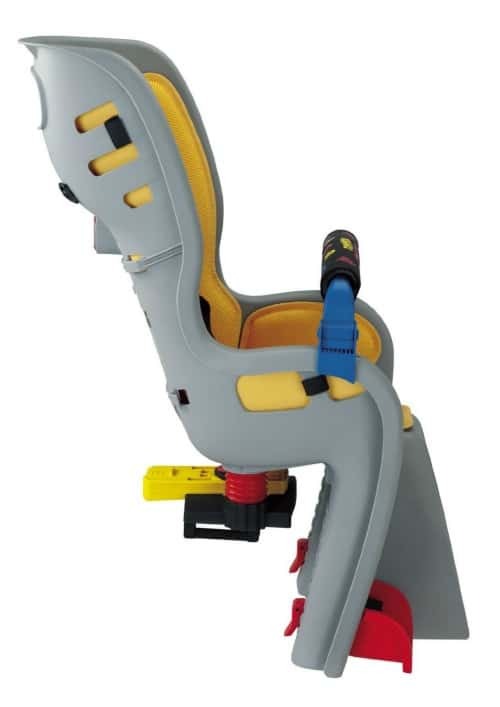 See more baby toddler seats here. This front mounted seat puts your kid up front by all the action, for those parents that worry about the safety of pulling kids from behind. It’s also super simple to install and remove. Bike trailers are an awesome way to transport multiple children at the same time. 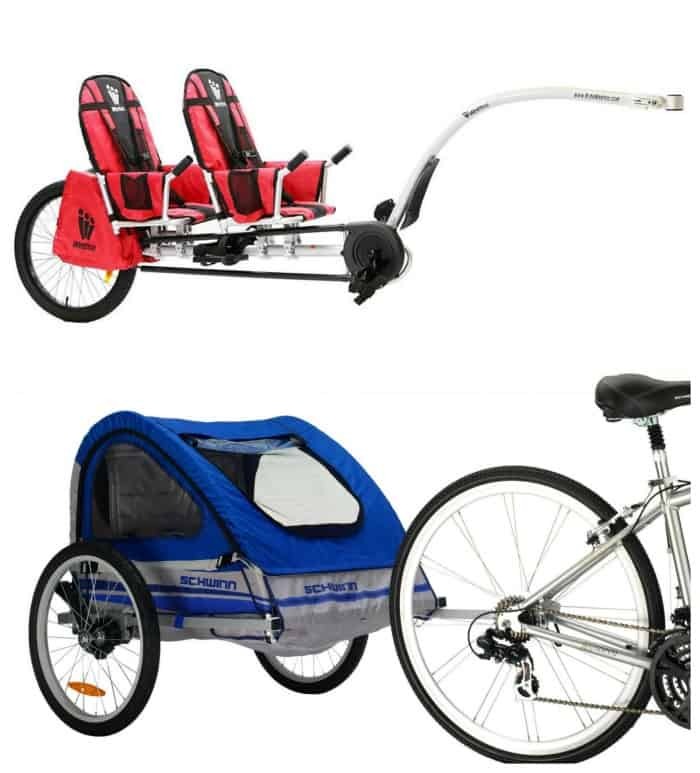 If you get a bike trailer, I would recommend getting either a jogging stroller/trailer combo (so that you can also use it as a stroller), or the Wee Hoo Adventure Bike Trailer for two. « It’s National Bike Month! Is there an option for one child who pedals and one who doesn’t? Heidi, yes. I believe the WeeHoo allows for one child to pedal and one to not. 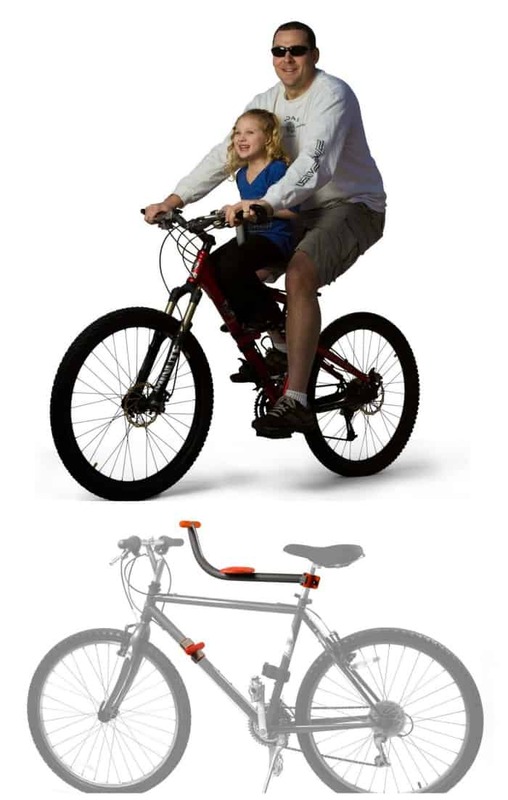 Or you could do a child seat attachment for the kid that doesn’t pedal, and then hook on one of the single rider options for your kid that likes to pedal. I have 3 who all need help. Right now I have a trailer & my husband got his hands on a double trail behind tandom. But that only works if we ALL want to go. Anything for 3? I love using it to get the kids around.